Mera Peak(6461) is the highest climbing/trekking peak in Nepal. 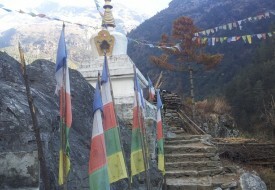 It is situated at Everest Region. Mera Peak Climbing begins from Lukla. We flow the Hinku Valley with beautiful forest and Mountain and Landscape. From it’s top you have wonderful views of five highest mountain above 8000m. Include Mt. Everest(8848m), Lotse(8516m), Makalu8463m), Kanchenjunga(8586m) and Cho Oyu(8201m) and other many small Mountain and Peaks. It is the good choice for those who love Adventure and Challenging trip. Mera Peak required physical fitness and minimum basic climbing skill. We designed Mera Peak Itinerary carefully where people can enjoy and fell comfortable. Day 02: Sightseeing in kathmandu and preparation for Trip.